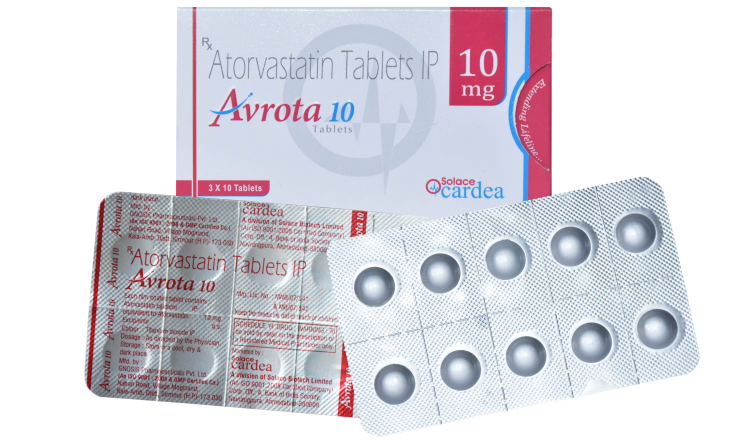 Avrota 10 contains atorvastatin. These are the class of drugs which are known as statins. These drugs are helpful in maintaining the lipid profile and prevents the events associated with cardiovascular diseases. 3-hydroxy-3-methylglutaryl-coenzyme A to mevalonate, which is a precursor of cholesterol and sterols. After oral administration the drug attain its peak plasma concentration attains in 1-2 hrs. The approximate bioavailability of the drug is 14%. The drug availability is effected by the presence of food. Nearly about 98% of the drug is bound to plasma protein. The drug produces its action by its forming its metabolites. The drug after pharmacological action its excreted through bile. The elimination half life is 14 hrs.